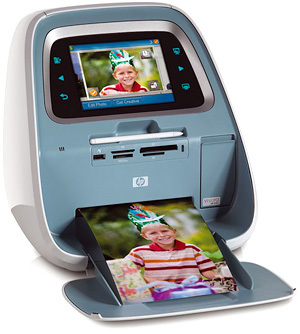 HP Photosmart A826 Printer – Clean Up Your Photos Without A PC | OhGizmo! By Andrew Liszewski on 10/22/07 • Leave a comment! Not content with just letting users view their photos on a printer’s LCD screen, HP has upped the ante on their Photosmart A826 model by including a 7-inch touch screen. It’s not only the largest display you’ll find on a consumer printer, but it also allows you to perform many photo editing tasks that usually require access to a PC and specialized software. You can add captions to a photo either by writing directly on the screen with a stylus (included) or your finger (not included) or by typing them in on a touch screen keyboard. You can also doodle on a photo, adding mustaches, knocked-out teeth and eye patches which is always comedy gold. For those photos that didn’t turn out as perfect as you’d like you can even use the stylus to remove red eye, adjust the contrast and other basic corrections. At $249.99 it’s probably not the type of printer you’re going to replace in 6 months, but if you like to skip the PC step when it comes to printing your photos this seems like a good solution.